The word “couture” in France has a more acclaimed meaning than it does here in the United States and when used it is not typically associated with simply a trend setting designer, but a brand that meets “well defined standards,” thus titling them “haute couture.” Haute couture is French for “high sewing” and is protected by law, with a few designers able to meet the specific criteria to gain the world-renowned label. I have no idea what entitles a brand to identify them self as an haute couture entrant, but I do have an understanding for the definition of dope! Random, but follow me on this magical school bus ride. When I say dope I do not mean the drug associated connotation that most people think of, but the adjective meaning extremely good. I don’t know about anyone else, but you are only branded “dope” by me unless you are the Beez Neez. The word couture however conjures up a more reputable definition as a clothing brand that delivers high end fashion, at a high end price. Now that you have been schooled in The Ovun’s third period English class it would seem difficult for a clothing line to be identified as both dope and couture, however an Indiana based clothing line as figured it out. Of the brand you ask the name yes? Dope Couture. Can you really ask for a more straightforward brand name? 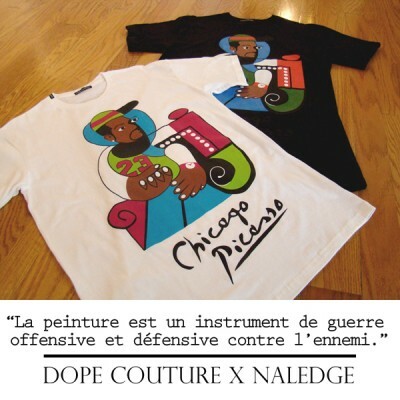 Dope Couture keeps it 100, they offer dope clothing, that by my definition is the beez neez, but at affordable pricing, playing on the word couture. Couture for this brand represents clothing designed with artistic creditability in mind and not profitability. DC wishes to deliver clothing that evokes pride in what you’re wearing and not insufficient funds fees.